You are here: Home / Ask an Expert / Ask An Expert: How Do I Create Content to Appeal to the Widest Audience? Ask An Expert: How Do I Create Content to Appeal to the Widest Audience? This question can be a bit complicated to answer. It’s not easy – there are no tips, tricks or a series of steps to take to make a certain type or piece of content appealing to the widest audience. Unfortunately, no one has a magic bullet for that, or I would surely be sharing that knowledge with you. If someone has that information, please share it with me! I do know a thing or two that I can tell you that will most certainly help with improving the appeal of the content you create. 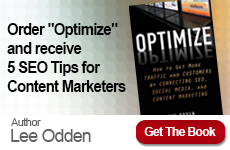 In a recent post on TopRankBlog titled How to Increase Business Blog Traffic, Readership, & Community, Lee Odden shared some tips and tricks for increasing reach through content creation. Though the post’s primary focus was about growing an online community, it also briefly touched on creating a “matrix of topics and media types” that appeal to target audiences. Making a matrix like this can go a long way to helping you create a variety of content in order to appeal to the widest audiences. To begin making your matrix, first you must discover your niche by asking some serious questions. What about your company, division, department or product stands out – in general or from other similar brands? 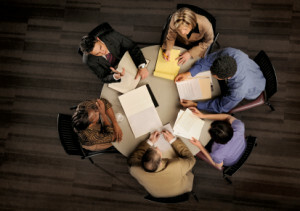 How do your customers see your brand and how do you want them to view it? What about your brand is the most important to them? Thoroughly explore and identify the major problems your business or brand solves for customers, your target audiences, and the messages that are important to your brand. Then try to group those ideas into a handful of categories. Next, think of the varying types of content that you’re capable of creating. Content ideas could include blog posts, online articles, videos, photographs, infographics, surveys, interviews, liveblogging, reports, and more. Different kinds of content appeal to different people – some may be more visually oriented while others prefer reading text and a few gravitate to videos in particular. It would be most beneficial to pursue whatever types of content you’re able to create and which suit your brand the best. Once you’ve mapped out your content creation matrix, it is time to start filling it out. That means getting more detailed about specifying the actual content that you will be creating. 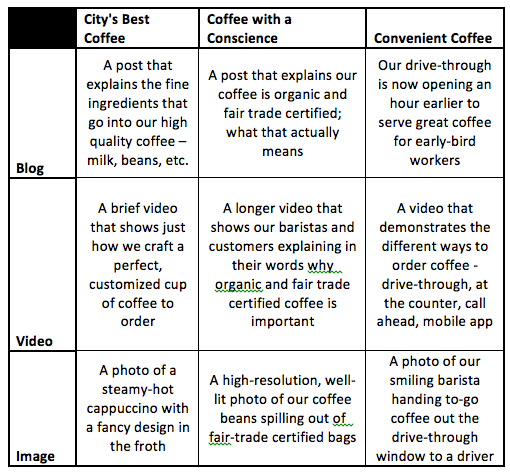 An example content creation matrix for a local coffee shop has been depicted below. Though this is set for one niche, it’s easy to see how this same concept can be applied to other industries and markets. How many types of content you create, whether text, video, images, online articles or whatever, are only limited by your capabilities; the topics restricted only by your brand standards. You may even consider expanding them, too – if you can’t make video but want to, buy a video camera! 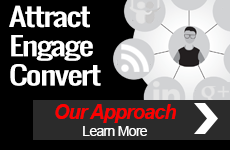 Apply new concepts to brand messaging or even use your blog to expand your message. By mapping out the specific media you plan to use for your content marketing and the topics you want to cover to appeal to different segments of the market, you increase your potential for reaching the widest audience.